My mom requested a new hat, so I decided to get right on it. I started it on January 8 and completed it on January 9. And then I gave it to her before getting a photograph. But a few days later I took it home to get a picture. And then I didn’t get around to photographing it for weeks. But today the sun came out. And now I can give the hat back to her. She says it makes her think of Spanky from Little Rascals. People always pick up my single skeins and say, “Well, what can I do with this?” And I usually suggest using it in combination with other yarns. But I’ve been wondering how far does a single skein go? 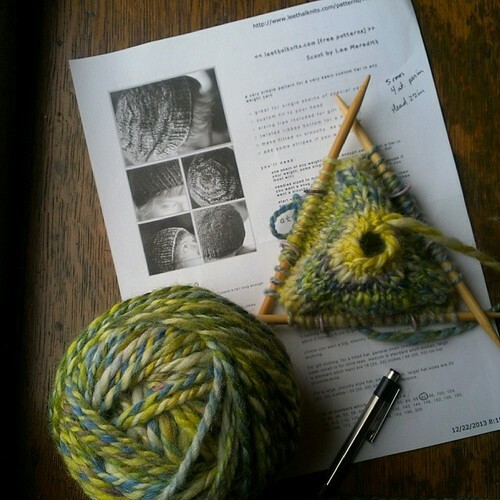 So I picked this skein – handspun, Cosy-dyed Falkland, about 170 yarns – and just started knitting. 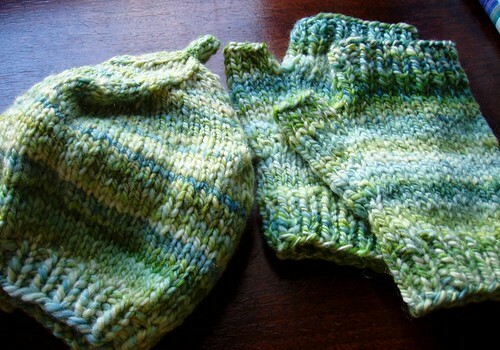 I started with a tam and then, having plenty left over, made a pair of fingerless mitts. 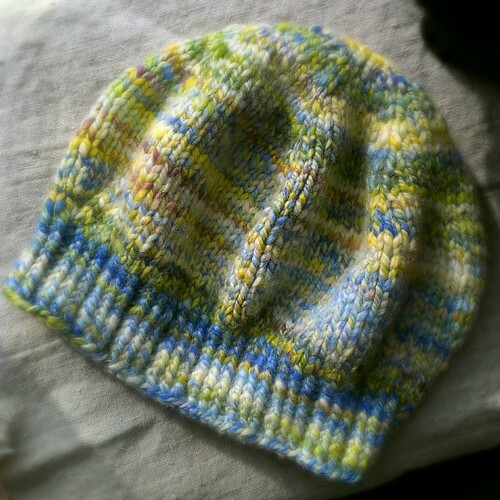 For my personal comfort, I’d say the hat could be a smidge bigger and the mitts a little smaller, but it’s all doable! I even had some yarn left. There’s always more in that skein or ball than you think, unless you are really hoping to finish a project and you’re pretty sure you’ll have enough, then you don’t. But this set will be a good sample before I take it to a craft show. 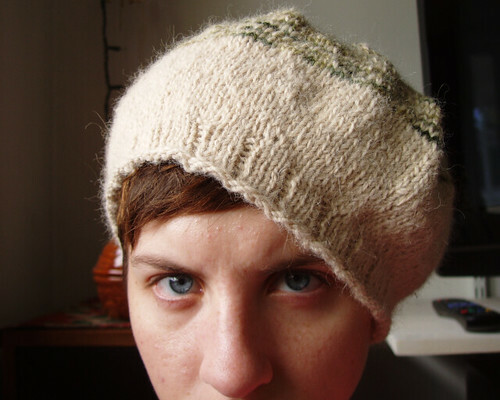 It might be possible that I haven’t knitted a hat in over a year. That makes me a wee bit sad. What I have been doing all that time? Probably not a whole lot of knitting, actually. 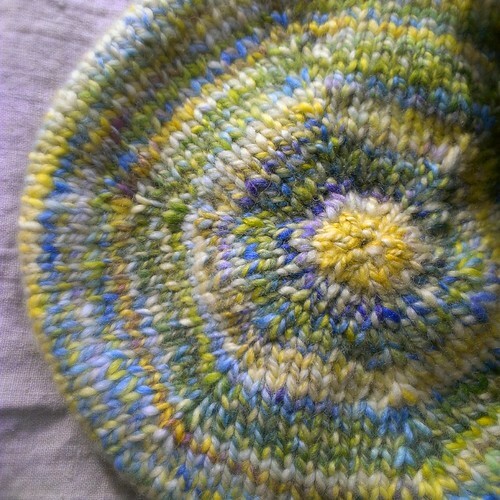 The last hat I made was the Green Circles in September 2009. This hat, ironically, was supposed to be something similar to a hat I used to wear when I was a kid (and now does not fit). It was long and tubular, flopping down, with gathers at the top and a huge pompom. It did not end up that way at all. But I still enjoy wearing it. The reason I say “ironically” in regards to Green Circles is because the hat I just finished today happens to be my second attempt at recreating that child’s hat! 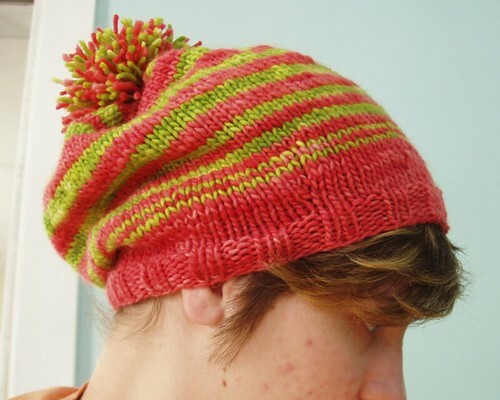 The newest one has been made out of Cosy’s Rainbow Chard handdyed yarn. 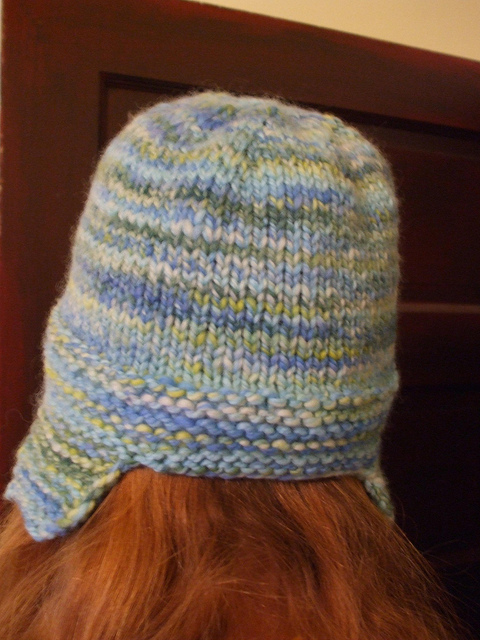 I think I’ve gotten closer to the shape of the original hat and I added a pompom too. 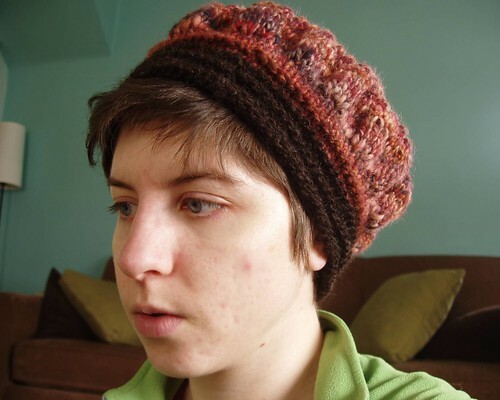 I’m not sure if that hat still exists someplace, maybe in my old bedroom. Perhaps I’ll try to recover it and then I’d have a better idea of it’s shape. alpaca samples: hat for me! 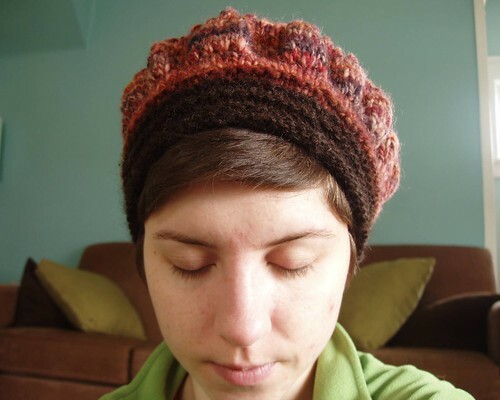 finished this hat yesterday. 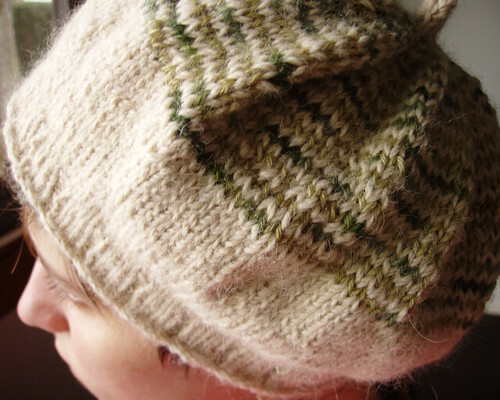 consists of a natural alpaca/merino blend and a green alpaca yarn. 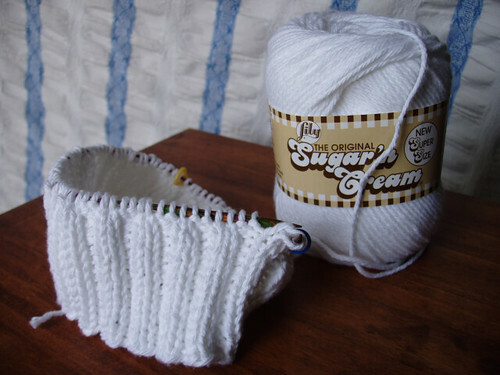 with left-overs, i will knit a pair of matching mittens. for some reason i tend to look a bit on the annoyed side in my photos. i felt relaxed when i was taking them. 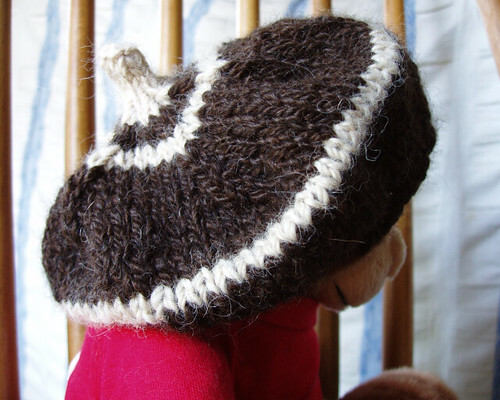 Continuing with the alpaca theme, I made a small beret with the left-over yarn from the fingerless mitts. Unfortunately I am incredibly bad at guessing how much yarn it will take to finish a project. 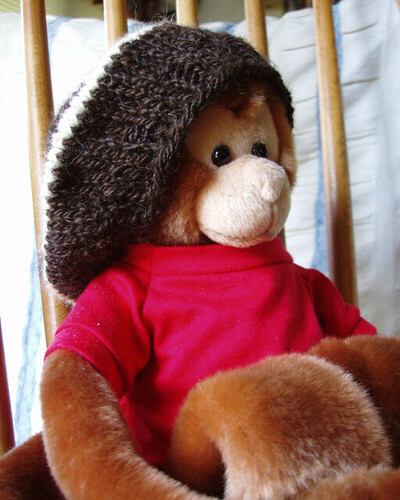 Therefore, I ended up with a very tiny hat that doesn’t quite fit any of my stuffed animals. Too small for Flick and slightly too big for this other little monkey. And guess what? I still have yarn left over from that ball! Yes, what is that boring white thing? White and cotton and boring. Have I mentioned lately that I dislike cotton greatly? Well, I do. 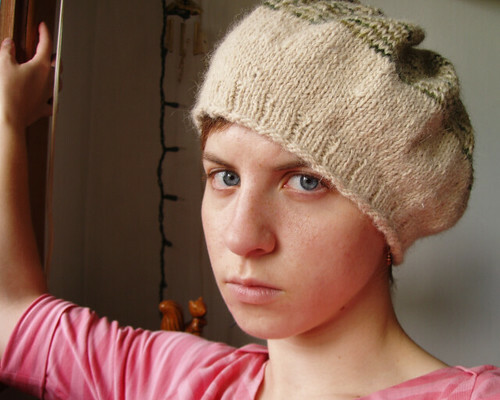 Interestingly enough, the last time I knit cotton was a project for my dad, something he requested. This current project is again a special request from my dad. You see, he happens to have an SCA persona that puts him in the desert where wool is not a primary fiber. That means every time he asks me to make something for him, it’s probably going to be cotton. Lucky for him I love him more than I hate cotton. This particular item is going to be a cap worn beneath his turban. So, if I am successful, no one will ever see it. I didn’t have a pattern to go on, which makes this dull white cotton WIP a little more interesting. The goal is to have it fit snuggly, ending right above his ears. The real question is: will he wear it?